There was a time when “experimental bourbon” would have sounded like an oxymoron. Bourbon, after all, is bound by law that defines it as “bourbon”. But every law has loopholes, so to speak. Of course, traditional bourbon as it’s been made since the latter half of the last century will always remain a mainstay. But in the recent past, the bourbon category has premium-ized and, in tandem with that, American craft distillers have stepped up to the plate and introduced an array of nouveau American whiskeys, so it’s little surprise that we’re finding traditional bourbon makers unveiling a few idiosyncratic yet influential twists that you might call “little steps” in the evolution of bourbon. Brown Forman’s Woodford Reserve provides a fine example of this movement with the introduction of its Master’s Collection limited releases. The inaugural release, Four Grain, hit the shelves in Kentucky fall 2OO5 and a second, final batch arrived in select states in late October the next year. It involved combining corn and malted barley with both rye and wheat and distilling the whiskey in the copper pot stills that all of Woodford is traditionally run through. Sonoma-Cutrer Finish followed in 2OO7 and in 2OO8 came the release of 1838 Sweet Mash, for which the mash from previous distillations (aka: sour mash) was eliminated. Seasoned Oak was the fourth arrival, and involved drying the staves of the barrel for an extra amount of time. “There are five sources of flavor when you’re making bourbon – grain, water, fermentation, distillation, and wood aging. We can change out one of the four parameters – anything but the water,” said Master Distiller Chris Morris when I visited the idyllic Brown-Forman Distillery in Louisville last autumn. Brown-Forman, which also makes Early Times and Old Forester bourbons, began as a bourbon company in 1872, but Woodford Reserve only launched in 1996 and for the first three years it was only sold in Kentucky. Two years after that it gained national distribution. Since 1999, it’s been the official bourbon of the Kentucky Derby. The fifth addition to the ever-expanding Master’s Collection series was just being unveiled during my visit: Maple Wood Finish, which clocks in at 94.4 proof. There were 18,OOO bottles of that expression – that’s all – and batches went out to seven export markets “who were begging for them,” Morris enthused. Massachusetts received 3OO bottles. In December, while making his rounds of a few states, Morris swung through Boston and I had the opportunity to speak with him again about the Master’s Collection, how it came to be and not just its role in the evolution of the American whiskey, but its effect on how the category is perceived by the global marketplace. Morris has been with Brown-Forman since 1976, when he joined the company as a lab trainee under Master Distiller Lincoln Henderson. He got a taste for the business side of the industry when, in the late 198Os, he went to work as a brand manager for the North American Whiskies Group for Glenmore Distilleries Company which, after a few mergers, became United Distillers and was later sold to Barton Brands (which is now a holding of the Sazerac Company). 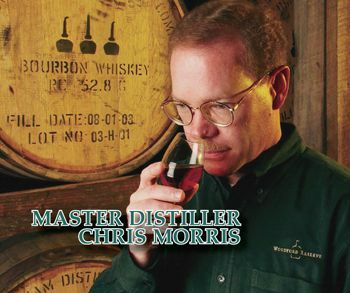 In 1997 he returned to Brown-Forman and began training under Henderson to become Master Distiller. At that time, talk began of trying out something new, and thus, under Henderson’s watch, the Four Grain was born. As Morris tells it, that release was a one-off and there were no plans to expand it into anything more thematic or ongoing, but Morris and Brand Director Wayne Rose got to talking, the idea emerged to “create a series of innovative whiskies and put an effort on the future,” said Morris. In developing each new release, Morris works closely with Bob Russell, the forester for the Brown-Forman Cooperage, whose expertise is picking out trees for use at the cooperage. The first and foremost consideration in conceiving each new Master’s Collection release is looking at what hard woods grow in Kentucky. “We’re not going to experiment with mahogany or zebra wood,” insists Morris. “I discuss different woods with Bob, he obtains a sample, then we start experimenting with wood chips. We winnow out what won’t work and then work our way to the cooperage. They make a small number of barrels and the trial continues. Basically we’re tasting and saying ‘this is the one we want to do,’ and the cooperage team puts together barrels. Once we’ve gone through experiments and decide, it could be just about a two year process until the finishes are accomplished, but the Maple Wood was just one year.” Morris revealed that there are three more exotic wood finishes presently slumbering in trial. It should be noted that Woodford starts with the built-in advantage of having the Brown-Forman Cooperage, making it the only bourbon company to craft its own barrels. That affords it an exceptional amount of control when it comes to access and the creative process. The Maple Wood Finish, for instance, rounds out Woodford Reserve in a maple wood barrel that’s toasted, not charred. Because of the wood’s natural sap, which can contain as much as 3% sugar, the whiskey has pronounced maple, honey and cinnamon notes. With interest in whiskey soaring and global competition increasing by orders of magnitude, nary is the company that can sit on its laurels, regardless of how far it’s risen above the completion in the past. The Master’s Collection is an achievement that points to new possibilities in whiskey making, keeping the Woodford name on the global industry’s frontline. “If you sit back and let the world come to you, it might never happen. We’re an American whiskey company and we want to be seen as leaders,” Morris said.